What is Stimerex ES by Hi Tech Pharmaceuticals? Have you tried coffee and energy drinks without success? Do you want to capture those high levels of energy youâ€™ve been chasing? Are you looking for a natural way to increase your fat burning? Stimerex ES by Hi Tech Pharmaceuticals is the ephedra-based supplement youâ€™ve been waiting for. 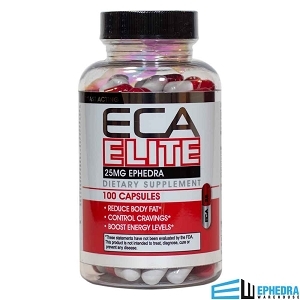 It is packed with 25 mg of ephedra extract along with several thermogenic ingredients that have been shown to promote higher energy levels, better focus, and increased metabolic rate. Stimerex ES by Hi Tech Pharmaceuticals is the naturally safe energy and weight loss supplement you need to achieve your goals. Who is Stimerex ES ideal for? Why is it effective? Do you find yourself needing to start your morning with coffee just to wake up? Do you feel like youâ€™re crashing before noon? Would you like to boost your metabolic response and burn more fat? Want to have enough energy to support your work day AND your workout? If you answered â€œyesâ€ to any of these questions, then Stimerex ES is going to be exactly what you need to feel great and lose weight. 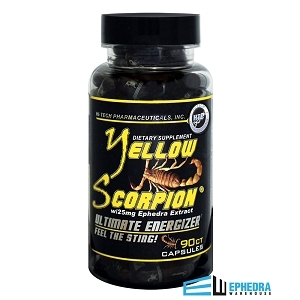 This high powered thermogenic is effective and completely safe; however, if you have prior heart-related medical conditions, you should speak with your doctor to see if it is right for you. Stimerex ES is effective for two reasons: an amazing formula and a proven delivery system. Stimerex ES uses a unique blend of ephedra and thermogenic ingredients. Together, this blend triggers the highest amount of energy. Stimerex ES is backed with Extend-RX, an incredible delivery system that promises maximum absorption. What are the benefits of using Stimerex ES? 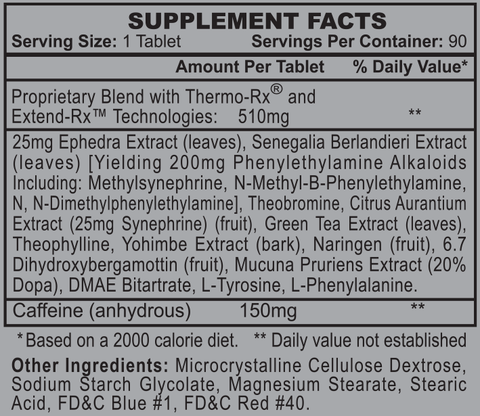 Stimerex ES is such a powerful supplement thanks to its list of proven thermogenic ingredients. There are plenty of energy supplements on the market but how many contain a proven formula? How many of these so-called energy supplements are going to provide you with enough energy to last through your work day, house work, and gym time? Only one: Stimerex ES. 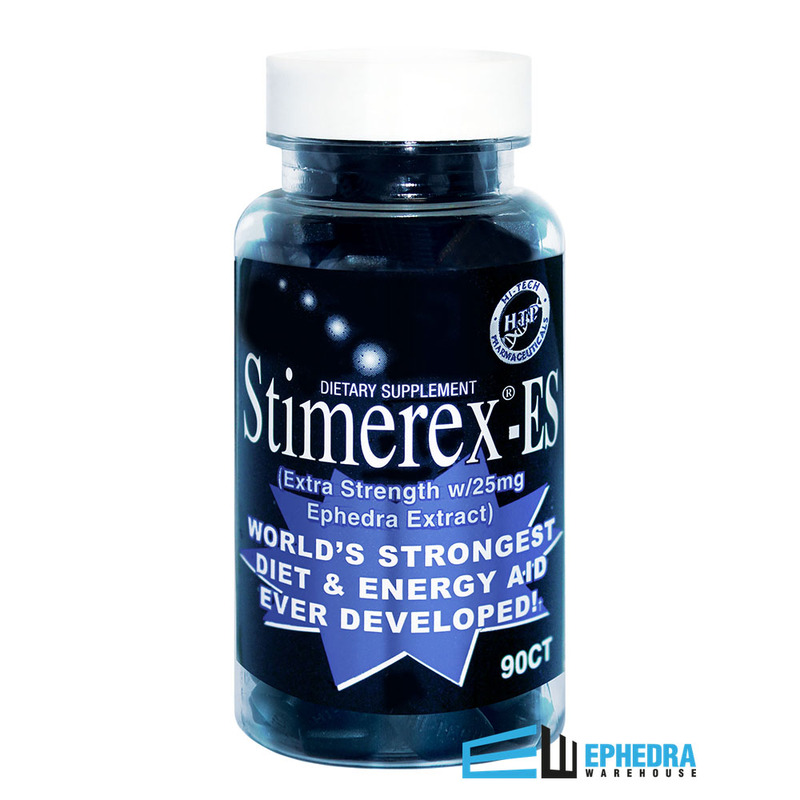 Supported by 25 mg of ephedra extract and a long list of super thermogenics, Stimerex ES has what you need to increase energy, trigger fat burning, and support a healthy weight loss. Get things done and achieve your fitness goals with Stimerex ES by Hi Tech Pharmaceuticals. 1. Venables MC, Hulston CJ, Cox HR, Jeukendrup AE. Green tea extract ingestion, fat oxidation, and glucose tolerance in healthy humans. Am J Clin Nutr. 2008 Mar;87(3):778-84. 2. Costill DL, Dalsky GP, Fink WJ. Effects of caffeine ingestion on metabolism and exercise performance. Medicine and Science in Sports [1978, 10(3):155-158]. I cant believe I finally found something that does not make me gittery and I can go hrs without picking on food like I usually do. It is difficult to suppress my appetite, but this product did it esp with the way I work out. Amazing! I lost 4 pds in 5 days! I need to lose 30 pds, so this stuff will do it! Finally! I just make sure my coffee is decaf so I am not hyper. Wow, seriously, one pill does it for me. It says on the bottle 3 a day at least, Nah, one for me will do. LOVE THIS STUFF. WHY??? Cause, on one pill no jitters, no crash, no crazy feeling in the pit of my stomach. Amazing energy for me. Helps me in my sports, helps me get to work and feel awake. I work a third shift. LOVE LOVE LOVE THIS. Glad I found it. It takes me awhile to sift thru other reviews and ingredients and this works. WORKS!!! I am not a guy that goes to the gym to work out. I am just a guy who works 6 days a week at a retail store to support my family. I used to drink a Monster a day and all that sugar. Now I take 2 of these a day and i feel great, alert and it does not leave that groggy feeling like the Monster used too. And i lost 20 pounds, too. Not dieting, just not in-taking a lot of sugar and junk anymore. these pills are very good for me. I love to take Stimerex ES for a nice energy boost. Keeps me alert throughout the work day without the jitters. It's my replacement for coffee. Love this product...seems to be working great! Curbs the appetite and gives you energy! Ive been using this product for years.Great price and sheds the pounds right off. I have tried 5 or 6 of your ephedra products. I find this the most effective product I have tried. Thank you! This product works better than most of the others currently available. It does work. I LOVE this stuff!! Tired black mamba and hellfire and it definitely isnt nearly as good! was losing 6lbs a week dropping about 20 before I switched tired the others and am ow regreting it! Im a 5'7 black female with a medium/small frame, works great! Going back on it so I can see that progress again! hoping for going down another 30! I've tried several of your products and I would say this one is just okay. I workout every day @ 4am so need that extra boost in order to get me going and I don't think this one has enough ephedra for me. I would also LOVE to find something that gives me that boost AND helps me loose weight but out of all the products I've tried they just give me the boost not any weight loss. Im on my 2nd bottle. I love the energy it gives me. Not jittery at all...just energy to not feel like I need a nap in the afternoons. Im eating so much better because Im not craving bad foods or that 2nd helping. I started wearing a pedometer and I have the energy to get 21000 steps a day. Ive lost 20 pounds in 5 weeks. That makes me very Happy! I love Stimerex! Highly recommend!! These work very well. They give extra energy and contol my appetite. They are very strong, so I started out taking half at a time. I like the tablet form so they can be cut in have. No jitters, just more alert through the day. This is a vary good energy boost! Long hours and then things to do at home, this gives the extra get up and go i need to finish a long day! Love it will be getting more befor i run out for sure!! Gives me more energy, but I don't think it helped with weight loss. Be careful not to take it in the morning on an empty stomach or before you go to bed...did give me a boost though! This pill gives me the energy I need and I have l ost 90 pounds because of this pill. Stimerex -es worked great! I am very alert and motivated while on it! Lost 8lbs of flab the first week while on a zero Carb diet. Would recommend to friends. Stimerex is exactly what it says it is: a fat burning appetite suppressing energy black diamond! I love this stuff and it makes me feel happy as well. Most diet supplements make people feel sick or wierd, but this does not have adverse affects. My hunger is controlled without pain and I have energy. I am a small person so only one pill in the early morning works perfect for me. I have dropped 10lbs in two weeks and going for 15 more to be at my ideal weight. I tried Stimerex after seeing the Hi-Tech Ad in Muscle Fitness Magazine. I have lost 20 lb of fat in the past 2 months. Stimerex ES makes me feel energized and keeps me from getting hungry with no jittters. it also helps me stay focused, which is great because im in accounting crunching numbers all day. I tried Stimerex ES and it works great. I have plenty of energy and really look forward to going to the gym everyday. I have lost about 12 lbs since ive started taking it. I am a 44 year old male and my metabolism is not what it used to be. I am going on a cruise and I wanted to lose about 10 lbs., and try to get my six pack abs showing again (it's been several years). Stimerex-ES really helped to curb my appetite, and give me the 'pick up' I needed to burn some extra calories. I lost 11 pounds in 6 weeks. while the tablets themselves look a little intimidating, they gave me wholesome energy levels a smooth and mild appetite suppression. as a stimulant energy booster i would recommend this product for any healthy individual looking for a little extra boost during the work day. for the record (and most safe and effective use of the stimerex-es) no outside sources of energy were used in addition eg caffeine energy drinks coffee illicit substances. I have used stimerex es for years now. It is the best diet/energy supplement I have found. I have had no negative side effects. Gives the boost other items out there dont!!!! Suggested Use: Take 1 tablet three times daily.